Federico Cortese led a professional cast of ten soloists and two orchestras from the Boston Youth Symphony Orchestras in an uncut, semi-staged performance of Verdi’s Rigoletto for a sold-out crowd in Sander’s Theater on Sunday, January 20. Adrian Slywotsky conducted multiple offstage ensembles, including a dozen string players placed in the small balcony directly over the main stage, and the important “banda” music featured in the first Act, from which soloists were drawn from both larger orchestras. 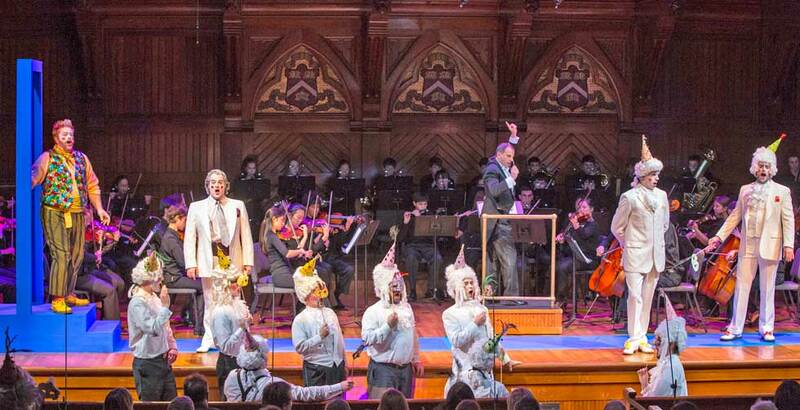 Sixteen men from the Handel and Haydn Society Chorus, singing without scores, appeared in full Baroque costume and formed an important part of Doug Fitch’s clever visual concept and staging. Founded in 1958 at Boston University, and led by Federico Cortese since 1999, the BYSO organization now includes three full symphonic orchestras, two string training orchestras, a preparatory wind ensemble, six chamber orchestras, a summer camp and extensive chamber music program. Under Cortese’s leadership, the institution has added nine new artistic staff positions, enticed members of the BSO to be coaches, and now has the largest operating budget of any youth orchestra in the United States. This performance featured two full orchestras (each including an offstage ensemble) from the BYSO organization, which each larger group on stage for half of the opera. Notable student soloists included timpanist Alyssa Michaud, trumpeters George Goodwin and Daniel Katz, trombonist Evan Wood, oboist Neha Bhatia, clarinetists felix Chen and Kyuil Lee, and both flute sections (Alexandra Conza, Amy Lipman, Elizabeth Sperry, and David Lassila, almost all of whom doubled on piccolo and played in the offstage banda as well). I chose Rigoletto because we were asked by the Italian Consulate, in our partnership with the Boston Symphony, to present something honoring the Verdi anniversary, and we wanted to do a big warhorse. However, I would not have chosen Rigoletto if I hadn’t thought that first of all, it’s a masterpiece, and second, that it has something that speaks to us today.” Mr. Cortese extensive operatic background includes productions in Florence, the Spoleto Festival in Italy and the United States, the Boston Lyric Opera, the St. Louis Opera, the Finnish National Opera, Opera Australia, and the Washington Opera, in addition to his work in the symphonic repertoire at Harvard and through his long association with the Boston Symphony. I think that the real touching part of the story is the poisoning effect of power, not just on the person that has the power, but on the people around the title character. No one respects Rigoletto, because in his world, there is no such thing as respect and friendship. I think there is an honesty and a strength in that opera that is very touching. From the first notes of Verdi’s score, the opening brass solos, ensemble work, and expressive timpani playing made it clear that this would be a nuanced performance, full of subtle variation. The offstage banda balanced well with the full ensemble and chorus of male courtiers to create a light, comic atmosphere for the introduction of Rolando Sanz’s charming Duke of Mantua. Through his ringing tone and effortless use of portamento and rubato in the ballata“Questa o quella,” Sanz made the Duke more likeable than he probably should have been. Rigoletto was dressed in a shockingly bright, sequined jester’s vest and warm colors, in contrast to the completely white makeup and attire of the rest of the court. 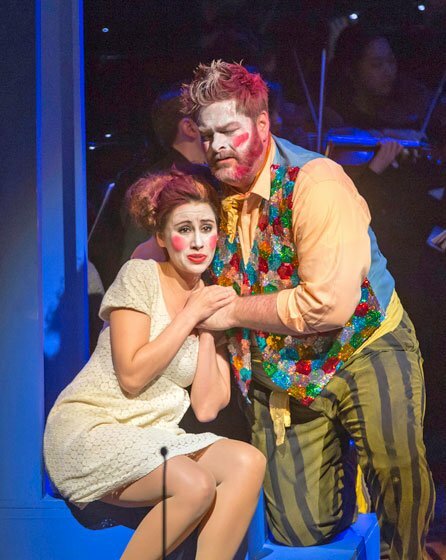 Portrayed with pathos and nuance by baritone Weston Hurt, Rigoletto stole most of the scenes he was in, and provided a believable father figure for Anya Matanovič’s radiant Gilda. Hurt’s opening aria featured beautifully sustained passages supported by great work from the flutes and piccolo. About the design concept of Rigoletto Cortese said, “Doug Fitch s a truly imaginative stage director. What is fascinating about him is that he turns everything into images.” The front of the stage was delineated by a royal blue carpet connecting two matching door frames. This allowed the actors to move seamlessly between indoor and outdoor scenes with no time wasted on scene changes (Verdi wrote no music for that purpose in several of his middle period works). When the angry Count Monterone appeared, framed in blue, bass-baritone David Kravitz’s interpretation recalled the bitterness typical of Mozart’s Don Giovanni basses through his expressive diction and nimble handling of the tricky accompanied recitativo sections. His curse on the Duke and Rigoletto for their past actions, and Rigoletto’s refusal to apologize were set by Verdi in a weirdly bright, major phrase. This set up the challenging choral finale to the scene, sung from memory by the men’s chorus in front of and around the edges of the central action. Maestro Cortese sang along with the chorus when it made dramatic sense, and often turned to face the chorus (and audience) as they entered the center of the stage. The second scene introduced the menacing murderer-for-hire, basso profundo Sparafucile, portrayed with gravitas by Grigory Soloviov. His famous self-introduction, outlining a descending octave, was framed by one of the shockingly blue doorways, and emphasized Soloviov’s intense dramatic and vocal presence. Rigoletto was involved in two difficult pieces in this scene: a duet with Sparafucile resulting in the assassin being sent away, and the extended monologue “Pari samo,” in which he meditated on the similarity of their professions (Rigoletto wounding with his wit, Sparafucile with a knife). Weston Hurt often sang these passages seated, or on his knees, which made his arioso and difficult recitative (accompanied beautifully by Cortese and a perfectly blended string section) the most moving and expressive part of the Act. Rigoletto’s hate and his feeling of being trapped by circumstance was interrupted by a poignant flute solo, introducing music later sung by his daughter, Gilda. Meredith Kelly sang two roles in the first part of the evening, excelling at the icy insincerity of the Countess of Ceprano while providing vocal warmth as Gilda’s maid, Giovanna. Anya Matanovič and Weston Hurt’s beautiful love duet “È il sol dell’anima” gave a powerful clarity to the role of Gilda, who seemed to mature from a young maiden into the full flower of womanhood through the power and increasingly more virtuosic use of her voice. Hurt’s Duke was as effective offstage as on, with perfectly timed exclamations and incredible control of changing tempos, textures, and stage movement (including several arias which ended far backstage). He was his best when singing with Gilda, which may have been intended by Verdi, as his Act II music is very different, depicting his loss of Gilda (“Ella mi fu rapita!”) and his later inability to remain faithful to her. 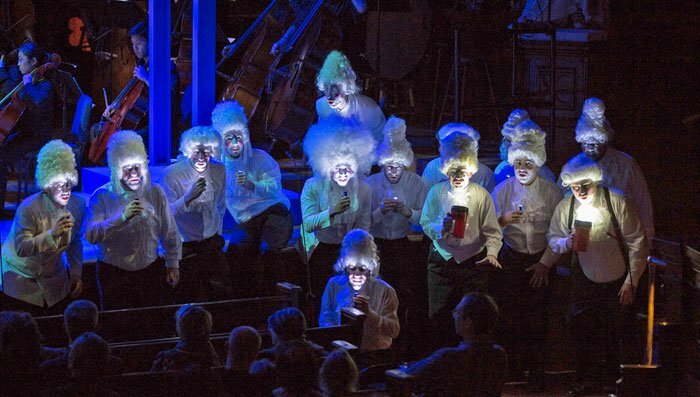 The Chorus shone in the staccato “abduction” number for Act I, “Zitti, ziti,” as they snuck onto the stage in darkness, holding flashlights to illuminate their faces (painted white) and huge white wigs. The second half of the production picked up in the middle of Act II, with Rigoletto searching the whole audience in the dark for his lost daughter. The strings supported Rigoletto’s angry aria and plea to the courtiers, “Cortigiani, vil razza dannata” with supple bowing and an attention to Cortese’s ever-changing demands for expression and rubato playing. The fluid melodies of the violin section blended well with ominous pedal tones in the brass. Placing Rigoletto onstage, right in front of the orchestra, allowed him to play to the other musicians, as well as the audience; this really took advantage of the in-the-round feeling of Sander’s Theater (especially when full to capacity). After hearing Gilda’s tragic confession of love for the Duke, Rigoletto responded with a heart-rending cabaletta “Sì, vendetta,” which received the longest and most resounding ovation of the evening. To this point, Verdi placed most of the burden of the drama on only three characters: the Duke, Rigoletto, and Gilda. In the final half of the production alone, the ever-enthusiastic Duke sang two duets, two extended arias, contributed to two ensemble numbers, and presented three different versions of his ironic ode to fickleness, “La donna è mobile.” Rolando Sanz played with these ideas vocally, sometimes adding humorous ornamentation and purposefully missed notes to demonstrate his character’s lack of seriousness. His costume, while remaining basically white, like the courtiers, gradually added more color and style, including a wide-collared unbuttoned pink blouse displaying a large gold medallion and an apple which he took bites of in between vocal phrases. Verdi’s Act III balanced those incredible demands with a famous quartet, “Un dì, se ben rammentomi”, for Sparafucile and his siren sister Maddalena (placed far stage right) contrasted with an intimate conversation between Gilda and her father (placed far stage left). Nora Graham-Smith’s Maddalena could have stepped right out of Bizet’s Carmen, as she sung with a lush, dark tone throughout her many duets and recitativo sections. Her love scene with the Count, although using only a tiny portion of the stage, played a powerful role in solidifying Verdi’s portrayal of the Duke as a flawed and lascivious character. The clarinets played a unifying role in Act III, with an expressive solo introducing Maddalena and a perfectly blended duo accompanying the Duke’s aria. Doug Fitch’s choices of staging and light color contributed to an effective and sometimes hair-raising final sequence of scenes. The orchestras played mostly in the dark throughout (with stand lights), enabling the house lighting to gradually shift from white/blue to red, and fade completely (except for sudden “lightning” effects accompanied by virtuosic flute solos) during the extended storm scene. Near the end of the opera, even the orchestra abandoned Rigoletto to some intimate moments of a cappella singing. Since each of the halves of the concert featured a different set of instrumentalists, the students were allowed to watch the contrasting part of the performance from the balcony. They participated in the long standing ovation following the performance, and were able to enjoy the same excellent English supertitles as the audience. This was the most elaborate and unified dramatic presentation the BYSO has presented, and it bodes well for the future of the organization. Under Cortese’s leadership the organization has become one of Boston’s leading presenters of opera.